"Promise me again you won't let me bleed to death...."
As the closing credits of Anthony D. Spire's Two Degrees rolled, a quote from the late, great beloved television film critic Gene Siskel came to mind. During one of the annual year-end 'worst of' retrospective shows he co-hosted with partner and fellow Chicago newspaper columnist Roger Ebert, Siskel remarked that all the films he chose for unworthy honors shared one thing in common: "They each took two hours out of our lives that we'll never get back." Gene, the torch has been passed. Now, part of me wants to go easy on a first time director. In the journals of cinematic history, there's many an example of an opening misfire on the resume of now classic helmers. Take Francis Ford Coppola, for example. To get to The Godfather, he survived Dementia 13 (the writer of this review is still recovering 13 years later, however). But when the most effective and appealing moment of a film centers around a convenience store clerk berating a non-purchasing customer asking for change, I have to put my John Stossel face on and go "give me a break!" Two Degrees certainly had all the ingredients for a potentially satisfying B-movie concoction: An attractive and capable cast coupled with the warhorse backdrop of gangsters and hoods. Terry Jackson (William L. Johnson) is an up and coming drug courier who makes the mistake of falling for the girlfriend of his drug dealing boss Wes (D.C. Curry). Although Jazzy (Yvette Ward) yearns to shed her past and start anew with Terry, the combined efforts of Wes and two crooked cops create mounting hurdles that the two lovebirds find hard to overcome. Even more of an obstacle? A schizophrenic script that leaves you wondering whether the movie is a comedy or a drama. Adding to the confusion are two minor subplots devoted respectively to a crack addicted mother and street corner hustler. Meant as comic relief, these sequences add nothing to the story and come off looking like bad MAD TV auditions. 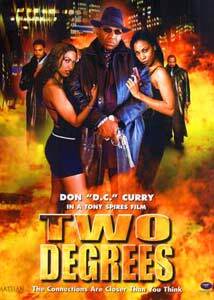 Awkwardly inserted flashback sequences and a meandering second half later, Two Degrees grew as cold to me as its namesake. Image Transfer Review: For the first half hour, it appeared that this film had been mastered by graduates of the Ron Popeil school of DVD mastering where the visual specialists set their levels and forgot about 'em. Honestly, there was more grain than a multi-generation Milton Berle kinescope . Yet quicker than an quality minded audience member would have made a beeline to the theater manager, visuals improved tremendously from the 30-minute point onward and were impressive for a film of low budget origin. Packaging note: Although the back cover lists a full-frame transfer, the film is actually letterboxed at approx. 1:85.1, yet strangely nonanamorphic (which might have solved the visual problems noted earlier). Audio Transfer Review: Ah, whaddya know, the all-positive portion of our review. First time film scorist Ida Bodin's jazzy incidental music is winning and receives a good showcase (as does the rap-filled soundtrack) via a very spatial and well engineered 5.1 mix. While not packing the aural bombast of flicks with bigger piggy banks, dialogue was crystal clear and easily understood. Extras Review: Given the rising profile of comedian Don Curry, it's a wonder that no commentary track is included on a practically featureless disc. It might have been more entertaining than the film. Although it's core audience may warm to it more than I did, Two Degrees is a weak slice of soul cinema that left me queasy. Instead, give me a double bill of Coffy and Shaft any day of the week.